We hope that you have a day filled with love and happiness. Take a minute to appreciate and find JOY in the ordinary today. 1. Make a hand print Valentine, use a fingerprint for the stem, two red hands for the heart and two green hand prints for the leaves. Your little ones will never be this small again, cherish your time with them because it goes by way too fast. 2. Instead of date night....let's face it a Valentine's night is always crowded, overpriced and rushed so avoid the crowd and have a family date night, make a heart shaped pizza together. Play games and make valentines for each other...it doesn't take much just a pack of doilies, some glitter glue and some stickers and you will have hours of fun! 4. Have a picnic at the park, enjoy some outdoor fun. 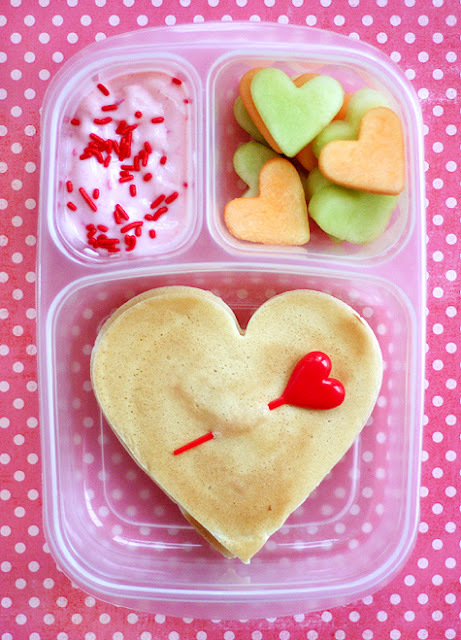 Pack a Heart themed lunch for an extra special treat!